A family of wild elephants has been trying to cross the dirt track for over an hour. The men holler and hoot. They lob rocks and throw lathis. They laugh with glee. 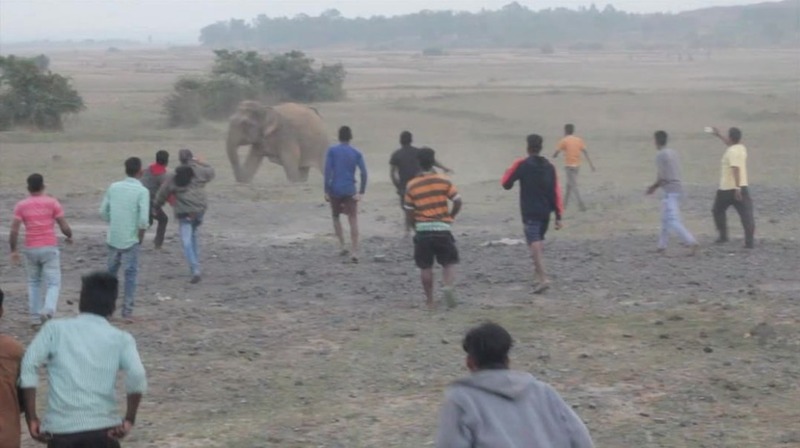 Disclaimer: The following is an account of a wildlife conservationist who witnessed a mob attack on an elephant family in the outskirts of Bhubaneswar and documented the whole incident and shared it on her Instagram profile. We are on the outskirts of Bhubaneswar and we are surrounded by men. The mob has swollen like a malignant tumor, from about 80 when we arrived to well over 300. Tiya’s lovely face is contorted by anguish. Isshaan, a man of few words at the best of times, has sealed his lips into a thin line. The energy is crackling through K.T’s wiry body as every fibre of his being focuses on the scene ahead. Adi is ever stoic. It is twilight, my favorite time of day in rural India, but there are no pleasures to be had today. The frenzy of the mob is overwhelming and the stench of testosterone and local brew has saturated the air. They are not acting in defense or retaliation. There are no standing crops and no homesteads to be protected. This is their evening entertainment. The grace and restraint of the elephants is humbling. The younger females of the herd are a fortress around the babies. Two others, the matriarch and her second in command we later learn, hold the defense. Every time the crowd gets too close they mock charge. It’s obvious that they are exhausted, and in between bouts, they caress each other with their snaking trunks. No doubt whispering words of encouragement to one another. I want to weep. If they choose to, they could kill two dozen men or more. If they did, I don’t think I could muster an ounce of remorse for the dead. ‘Human-wildlife conflict’ is a well-flogged catchphrase in the conservation world. But this is not conflict. This is abuse. The vile festivities continue till the sun mercifully sets and plunges the land into darkness. We wait by the car – packing equipment, and processing our emotions. Something shines amidst the trees by the side of the road, so I step closer. My breath hitches as I recognize the silhouette of two young bull elephants, their tusks gleaming in the low light. They have been waiting for the mayhem to end, and now they quietly, softly cross over to join the herd.